Count Inoue Kaoru (井上 馨, Inoue Kaoru) (January, 1836 – September 1, 1915) was a Japanese statesman and a member of the Meiji oligarchy that ruled Japan during the Meiji period (1868–1912). 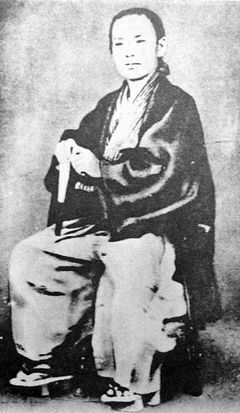 As a youth, he was active in the sonno joi (revere the emperor and expel the barbarians) movement, but became convinced that it was necessary to learn about the West in order to protect Japan’s sovereignty, and secretly went to study in London with the Chōshū Five in 1863. After the Meiji Restoration in 1868, he held such important posts as san'yo (senior counselor), taifu (senior vice minister) of Finance, sangi (councilor), and important positions in the ministries of industry and foreign affairs. He was influential in reorganizing and modernizing government finances, especially through the reform of the land tax system, termination of government stipends to the ex-samurai and former aristocracy, and promotion of the industrialization of Japan. Inoue was heavily involved in business and finance, and had close connections to the Mitsui zaibatsu (business conglomerates). In 1876, he was involved in the conclusion of the Japan-Korea Treaty of Amity. In 1885, Inoue became foreign minister in the first Ito cabinet. In order to gain the respect of Western powers and protect the sovereignty of Japan, he promoted the Westernization of Japan, symbolized by the Rokumeikan (鹿鳴館, Deer Cry Pavilion), a monumental building constructed to house foreign dignitaries. His efforts to revise the unequal treaties were unpopular, and he was forced to resign his post in 1887. After his retirement from active politics in 1889, he continued to play an influential role as a genro (elder statesman). Inoue Kaoru was born Inoue Yakichi (勇吉) in January, 1836, to a lower-ranked samurai family in Hagi (present day Yamaguchi Prefecture). Inoue attended the Han school with his brother Ikutarō (幾太郎). He was a close boyhood friend of Ito Hirobumi who later became Japan's first prime minister, and he played an active part in the sonno joi (“revere the emperor and expel the barbarians”) movement, in Chōshū. In 1858, he went to Edo to study rangaku (Dutch learning, or Western learning), gunnery, and swordsmanship, and there he associated himself with like-minded people. Desiring to rid Japan of foreigners, he and Takasugi Shinsaku set fire to the British legation in Edo in 1862, and as a consequence he spent seven days in jail. This experience made him aware of his powerlessness. Recognizing Japan's need to learn from the western powers, he joined the Chōshū Five and went to study Western technology in London. The group, which also included Ito Hirobumi and Yamao Yozo, left Japan in 1863, and worked their way to England as ordinary sailors. The following year, news reached them of a crisis in Japan over the bombardment of foreign ships by their own clan. He returned quickly with Ito Hirobumi, and unsuccessfully tried to prevent war (the Battle of Shimonoseki) between the Chōshū and the western naval powers over the closing of the Straits of Shimonoseki to foreign shipping. After this effort failed, Inoue was attacked and injured by reactionary samurai. Later, he played a key role in the formation of the Satcho Alliance against the Tokugawa bakufu. With the overthrow of the Tokugawa clan, which had ruled Japan from 1603 to 1867, and the restoration of power to the Meiji emperor, Inoue became a leading member of the government After the Meiji restoration of 1868, Inoue served in several important government positions until being appointed Vice Minister of Finance in 1871. He was influential in reorganizing and modernizing government finances, especially through the reform of the land tax system, termination of government stipends to the ex-samurai and former aristocracy, and promotion of the industrialization of Japan. These measures created many political enemies, and Inoue was forced to resign in May 1873. In 1876, he was involved in the conclusion of the Japan-Korea Treaty of Amity as Vice-Ambassador Extraordinary and Plenipotentiary. Closely linked to business circles, including Mitsui, he was also involved in the railway business. He returned to government as Minister of Land, Infrastructure, and Transport in 1878, and Minster of Foreign Affairs in 1879. After Ito became prime minister in 1885, Inoue served successively as foreign minister, minister of the interior, and minister of finance. In 1887, he was forced to resign his position as foreign minister in the first Ito administration because of his failure to negotiate a satisfactory revision of the “unequal treaties” and because of his unpopular Westernizing influence. Later, he served as Minister of Agriculture and Commerce in the Kuroda administration, as Home Minister in the second Ito administration, and again as Finance Minister in the third Ito administration. While serving as diplomat to Chosun dynasty Korea, Inoue was involved in the murder of Empress Myeongseong in 1895. 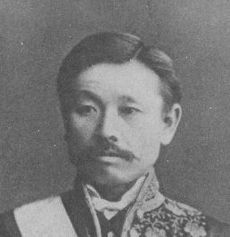 Inoue retired from active politics in 1898, but continue to play an influential role in the government. From 1901, he served as most senior of the genro (elder statesmen), and considered himself the government's foremost adviser on financial affairs. During the Russo-Japanese War (1904–05) he was appointed special adviser to the minister of finance and, at the Emperor’s request, attended all important state councils. Inoue was closely associated with financial circles in Japan, and had connections with the the giant Mitsui zaibatsu (zaibatsu were large, family-owned financial empires). Saigo Takamori once sarcastically referred to him as "Chief Minister for Mitsui." Inoue viewed Mitsui as a vital element in the process of industrializing Japan. He became a marquess in 1907. Inoue died on September 1, 1915. In the late nineteenth century, as increasing numbers of foreign dignitaries visited Japan, the Meiji government needed to provide appropriate accommodations for them. Initially, guests were housed in the Enryokan, also known as the Hamagoten, situated within the Hama Detached Palace in Tokyo, a building which had been refurbished with a Western interior to house important foreign visitors. Eventually the construction of a custom-designed building became necessary. In 1880, with the support of Inoue Kaoru, the Japanese government approved a budget of one hundred thousand yen for the construction of the Rokumeikan (Deer Cry Pavilion). Inoue wanted to construct a monumental, Western-style building that would be a visible symbol of Japan’s political maturity. As Minister of Foreign Affairs, it was Inoue’s task to improve Japan’s standing in the negotiation of treaties with foreign powers. In London (1876-78), Inoue had attended lectures on John Stuart Mill, whose book Utilitarianism, on Liberty, Considerations on Representative Government (1861), advocated self-determination only for nations who demonstrated a “maturity of civilization” similar to that of England. Inoue realized that, in order to gain the respect of Europe and the United States, Japan must demonstrate cultural equality. He believed that Japan must appropriate Western civilization if it was to deal with Western nations on equal terms, and safeguard its status as a sovereign nation. The Rokumeikan was to be a vehicle for educating the Japanese aristocracy in Western ways, and for impressing foreign visitors with Japan’s cultural advancement. Outlying territories of some size and population, which are held as dependencies … may be divided into two classes. Some are composed of people of similar civilization to the ruling country, capable of, and ripe for, representative government: such as the British possessions in America and Australia. Others, like India, are still at a great distance from that state. (John Stuart Mill, Utilitarianism, on Liberty; Consideration' on Representative Government London: J. M. Dent, 1993), 409. At the same time, a large public building such as the Rokumeikan would assure the Japanese people of the political stability of the Meiji regime. The name Rokumeikan was derived from an old Chinese poem in the Book of Songs about hospitality for a guest, and was given to the building by Nakai Hiroshi, the first husband of Inoue Kaoru's wife Takeko. The commission for its design awarded to Josiah Conder (1852-1920), a young architect trained in London, under Thomas Roger Smith and William Burges, who had been brought to Japan as an oyatoi (foreign expert) to construct Westernized public buildings for the Meiji regime. Conder designed an imposing Western-style building, incorporating some Japanese elements which were apparent mainly to Westerners. Construction started the following year in Tokyo, on a site just next to where the Imperial Hotel was later built. On November 28, 1883, the building was officially opened with a gala to which some twelve hundred guests, including foreign diplomats, members of the Japanese nobility, and high-ranking bureaucrats were invited. Although the Rokumeikan was intended mainly to provide suitable accommodations for foreign visitors, it soon assumed a far wider role as a setting for functions such as parties, charity bazaars, and its famous balls, at which Japanese functionaries and aristocrats wore Western dress and practiced Western manners, table etiquette and dancing. Between 1883 and 1887, the Rokumeikan became a symbol of the new Western way of life espoused during the Meiji period. Ironically, Inoue was forced to resign as foreign minister in 1887, by reactionaries who felt that he had made too many concessions to Western nations in his renegotiation of the unequal treaties. After Inoue's resignation, the importance of the Rokumeikan diminished, partially because of the structure’s weak foundations. (The project had exceeded its initial allocation by at least forty thousand yen because of difficulties in stabilizing the ground.) There were reports of crooked pillars and nearly-collapsing floors. In 1897, the Kazoku Kaikan (Peers' Club) commissioned Conder to renovate the building; the building underwent considerable changes and at the completion of the renovation, the name of the building was changed from Rokumeikan to Kazoku Kaikan. It was eventually demolished in 1935. The Chōshū Five (長州五傑, Chōshū Goketsu) were members of the Chōshū han of western Japan who studied in England from 1863 at University College, London, under the guidance of Professor Alexander William Williamson. It was still illegal to leave Japan when they left, as sakoku (isolation) was still enforced until the Meiji Restoration. A Mr. Weigal, Jardine Matheson's manager in Yokohama, put the Chōshū youths, disguised as English sailors, aboard a reluctant Captain J. S. Gower's vessel at 1000 ryō each, bound for Shanghai, where they were sheltered on an opium storage ship before dividing into two groups for the long voyage to London. When they reached London, the Chōshū students were introduced by William Matheson to Professor Alexander Williamson. Inoue Kaoru and Ito Hirobumi, destined to be two of the greatest Japanese statesmen of the age, worked as deckhands aboard the 1500 ton steamer, Pegasus, on the voyage to Europe. They returned earlier than the other three when they realized that the Chōshū clan was in danger of attack by the allied powers for trying to close the Straits of Shimonoseki to foreign shipping. Barr, Pat. The Deer Cry Pavilion: A Story of Westerners in Japan 1868-1905. London: Macmillan, 1968. Tomita, Hitoshi. Rokumeikan: Giseiyoka no sekai (Deer Cry Pavilion: The world of pseudo-Westernization). Tokyo: Hakusuisha, 1984. Watanabe, Toshio. Josiah Conder's Rokumeikan: architecture and national representation in Meiji Japan (Japan 1868-1945: Art, Architecture, and National Identity). Art Journal, September 22, 1996. This page was last modified on 3 March 2018, at 21:43.